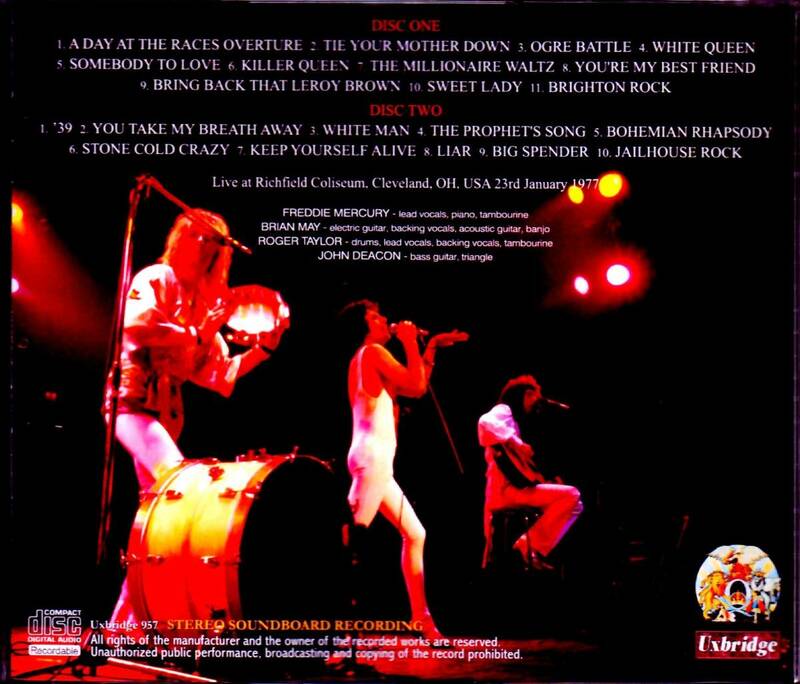 Recorded: Live at Richfield Coliseum, Cleveland, OH, USA 23rd January 1977. Comments: This concert has previously been released by Japanese label 'Breakdown' in December 2006, with title 'A Day At The Coliseum'. Uxbridge claimed this is stereo soundboard in more than less excellent quality. I don't have this bootleg, but it's the same tracks ac the Breakdown release, so I'm not so sure of the sound. Precious stereo sound board recording of "A DAY AT THE RACES TOUR". That highest quality quality board is appearing. Such a work is contained in "Cleveland Performance on 23rd January 1977". Speaking of 1977, the time when two world tours "A DAY AT THE RACES TOUR" and "NEWS OF THE WORLD TOUR" intersect. Let's first examine the position of the show from the whole picture. "A DAY AT THE RACES TOUR"
"October 28" NEWS OF THE WORLD "Release"
"NEWS OF THE WORLD TOUR"
This is the whole view of the two tours. QUEEN, who released "brilliant lace" at the end of 1976, started the tour after the year has changed. This work 's Cleveland performance was a concert that was the first performance of' North America # 1 'in the opening stage. This show has traditionally been known as "A DAY AT THE RACES TOUR" few sound board recordings. However, its quality is now two places, far from being an official substitute. When praising an audience recording, it may be expressed as "much better than a bad sound board", but it was a recording like a sample of that poor sound board. Although this work is also such Cleveland SBD, the highest peak master among them. Coremania LUCIFER BURNS unveiled numerous shock masters abroad and was released by Mr. LUCIFER BURNS, it is the master who declared "This is the definitive version". In fact, there is no lie in that word. Even this work is still not "official substitution", it lacks "In The Lap Of The Gods ... Revisited", "Now I'm Here" and "God Save The Queen"
However, it is fresher than any version which has been exchanged in the net / trade, and there are few Yore. No good audience recording has been found from this show, and this work is the best record. And since it is a sound board, the real pleasure is tremendous. There will be no distance feeling, etc. The core that is on violently pours directly into the brain. There is almost no audience presence other than between songs, rather than a concert sense of close contact as if witnessing the rehearsal just like the actual. To tell the truth, it is also a show where Freddie's condition gradually falls as it becomes late in the second half, but I understand that such subtle change is clear. You can fully enjoy the catharsis of just the sound board that you can sync with the performance of four people at zero distance. That 's because it is "A DAY AT THE RACES TOUR" that is drawn with that quality. Because there are masterpiece sound boards left and right tours, there is no song that can only be heard here. For example, if our shop is a masterpiece "DEFINITIVE HYDE PARK 1976 (Wardour - 288)" "ULTIMATE HOUSTON 1977 (Wardour - 246)", you can listen to any song by soundboard take. However, the flow of the show is "A DAY AT THE RACES TOUR". "A Day At The Races Overture" leads not to "Bohemian Rhapsody" or "We Will Rock You" but "Tie Your Mother Down", and "Somebody To Love" "The Millionaire Waltz" "White Man" The new songs of "brilliant lace" are also fresh. 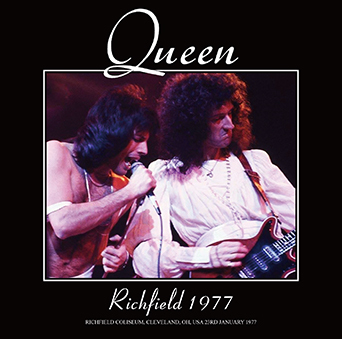 The "White Man" guitar solo turns round with a brilliant stereo feeling, and the effect group which colors Freddie's singing voice with "The Prophet's Song" which follows is vividly violent. This real pleasure can not be tasted by the audience. It does not reach the level representing the tour, it is also an incomplete recording. Therefore, although it can not hope for permanent preservation press conversion, there is plenty of stereo feeling to stir a sense of syncope and brains that can only be found on the soundboard. It is a live album that you can taste the world of wonderful "A DAY AT THE RACES TOUR" with that feeling. Coremania is also the highest peak master of precious sound board recording. Please enjoy it carefully.